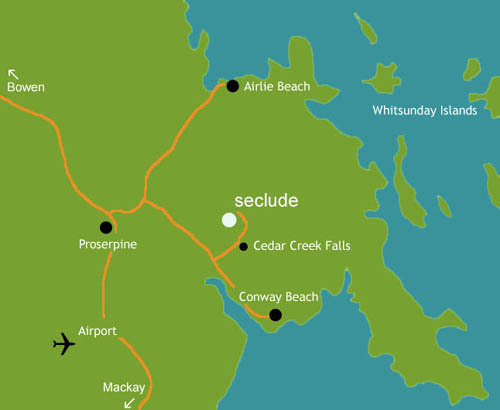 Seclude is located in a peaceful valley within the Whitsunday region of tropical North Queensland. Ideally located and within easy driving distances from both the Whitsunday Coast Airport (Proserpine Airport) and the Airlie Beach township. Take in an atmosphere of privacy, beauty and tranquillity at Seclude or explore the beauty and magic of nearby attractions such as Cedar Creek Falls, Conway Beach or the Great Barrier Reef. All are within easy reach. Follow Shute Harbour Rd. heading towards Proserpine. Before getting to Proserpine, turn left at Conway Rd (sometimes called Conway Beach Rd.). Turn left again at Saltwater Creek Rd. Seclude is exactly 6.37 Km along Saltwater Creek Rd. Turn into Shute Harbour Rd. and travel towards Airlie Beach. Before getting to Airlie Beach, turn right at Conway Rd. (sometimes called Conway Beach Rd.). Turn left at Saltwater Creek Rd. 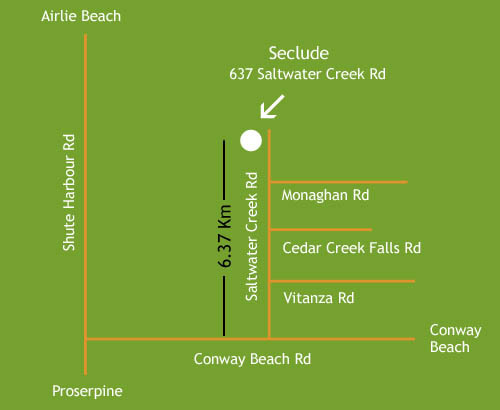 Seclude is exactly 6.37 Km along Saltwater Creek Rd.